A quiet and picturesque peninsula, Railay Beach sits between Krabi and Ao Nang. Accessible only by boat, the area offers an atmosphere of seclusion unavailable in other local coastal areas. The waters here feel protected and calm; tall limestone cliffs enclose the main bay and are a draw for some visitors who come seeking climbing experience. The beach supports dense mangroves in this area where sea and land meet. Amenities here include restaurants and cafes with sea views. Railay Beach is in Krabi Town. 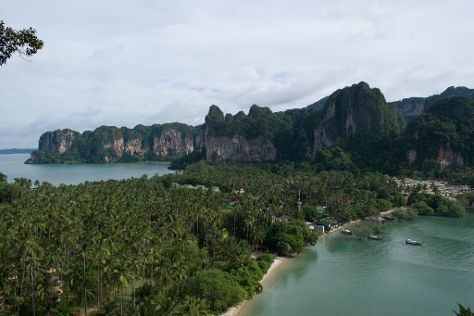 Use our Thailand trip itinerary website to arrange your visit to Railay Beach and any other destinations in Thailand that take your fancy.